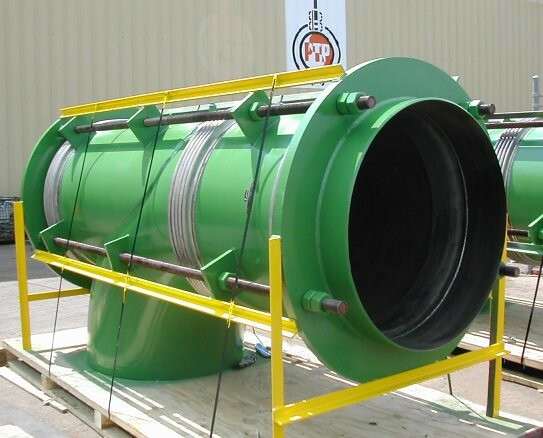 The existing pressure balanced elbow expansion joint with liners was re-designed with turning vanes to eliminate the vibration impact on the bellows. 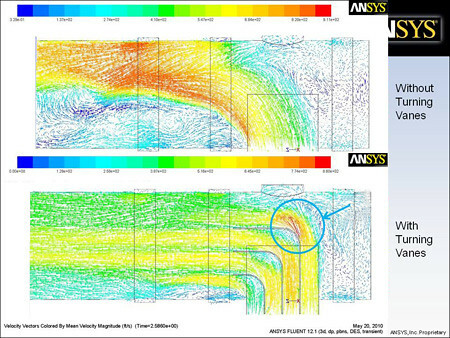 U.S. Bellows performed a computational fluid dynamics (CFD) analysis to determine the design of the turning vanes. The turning vanes redirect the flow stream, which creates a smoother flow, thus eliminating the flow induced vibration. The bellows and liner were fabricated from 321 stainless steel and the rest is fabricated from carbon steel. 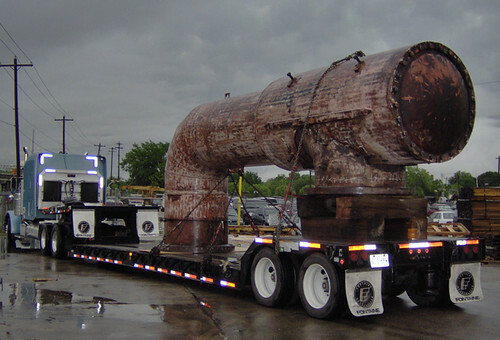 An air and soap test was performed prior to shipping it to a power plant in Washington. 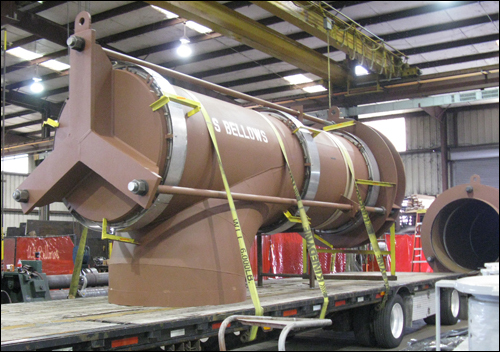 U.S. Bellows, Inc. received this 26″ diameter pressure balanced elbow expansion joint for a complete refurbishment. New SA-240 type 321 stainless steel bellows were used to replace the original bellows, and the tie rods and flow liners were also replaced. All carbon steel parts were painted with a universal primer. 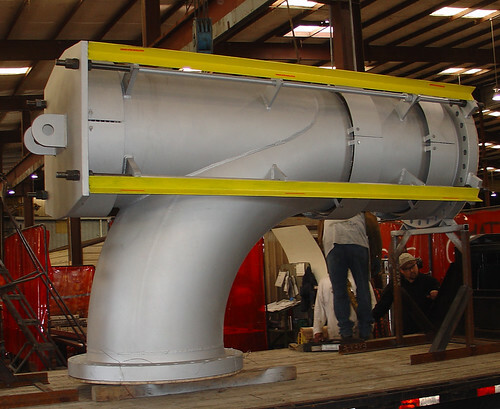 This expansion joint measures over 17 feet long center to center of elbows, and is currently being used in an effluent header at Cedar Bayou plant. The universal pressure balanced elbow expansion joints were fabricated with 304 stainless steel bellows and carbon steel reinforcing root rings. The expansion joints were designed for an axial compression of .25″, extension of .75″, and lateral of 1″. 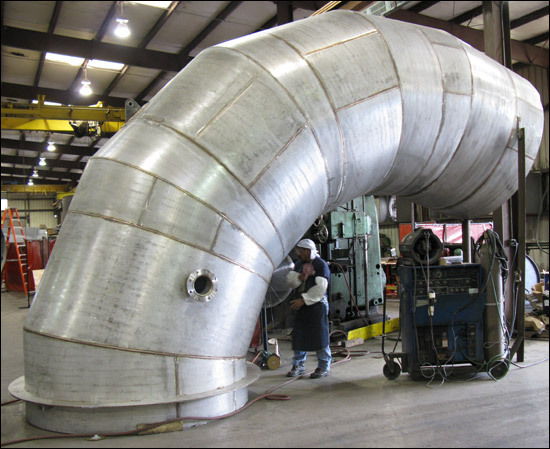 They have an overall length of 237″ from center line or elbow to face of the weld end. 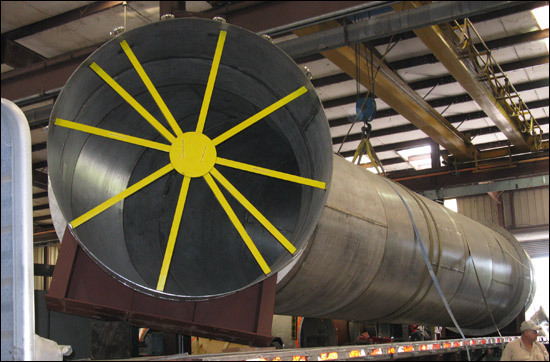 All expansion joints were designed for 100 PSIG and hydro-tested at 150 PSIG. 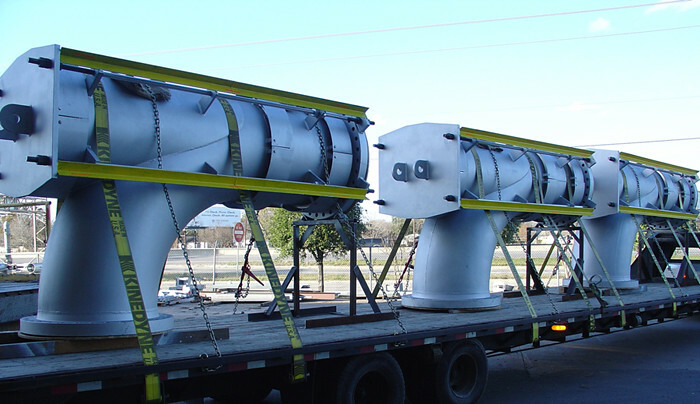 U.S. Bellows, Inc. designed and fabricated 36″ pressure balanced elbow expansion joints that weigh approximately 4,300 lbs each. The pressure balanced design does not exert pressure thrust on the equipment in the piping system. The expansion joints are designed with Inconel® 625 grade LCF bellows and include a liner provided with drain holes to prevent accumulation of corrosive condensation. The design movements are 1/2″ axial compression and 3/4″ lateral movement. 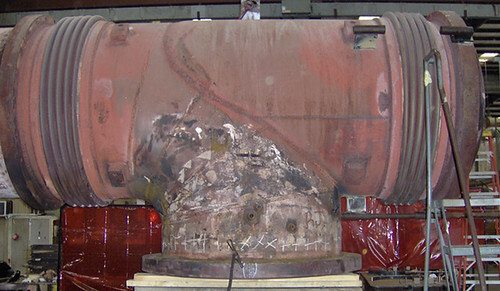 The bellows were 100% x-rayed before forming and dye-penetrant examined after forming. 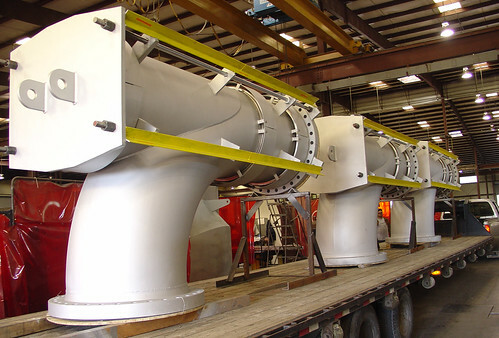 US Bellows, Inc. refurbished two pressure balanced elbow expansion joints for a power generation plant with a quick turnaround during outages. 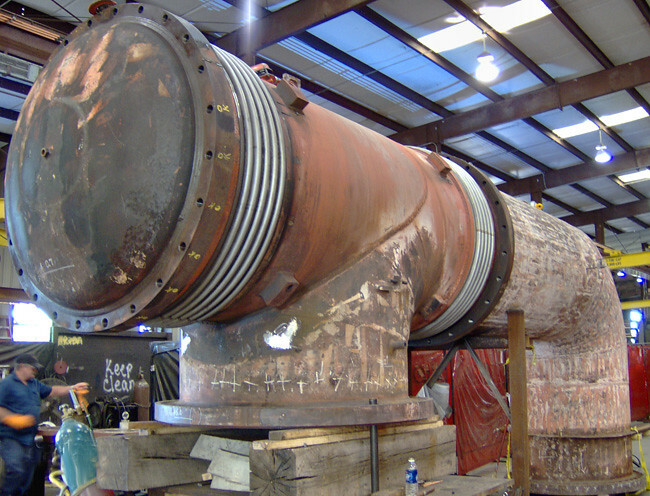 The first 54″ outside diameter expansion joint leaked from a crack in the bellows causing an unscheduled power plant outage. 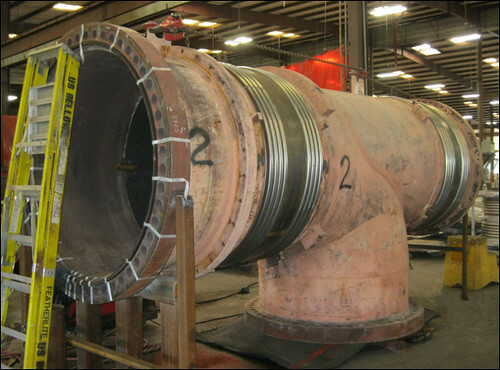 This particular expansion joint was fabricated for a high pressure turbine crossover piping for steam service of 97 PSIG at 634°F. The 27′ long, 27,000 lb. expansion joint was refurbished in less than 4 weeks. This was made possible by utilizing dedicated employees working overtime 6 days a week. The 321 stainless steel bellows and carbon steel root rings were replaced. The outside cover bolts were removed and new bolts were installed. 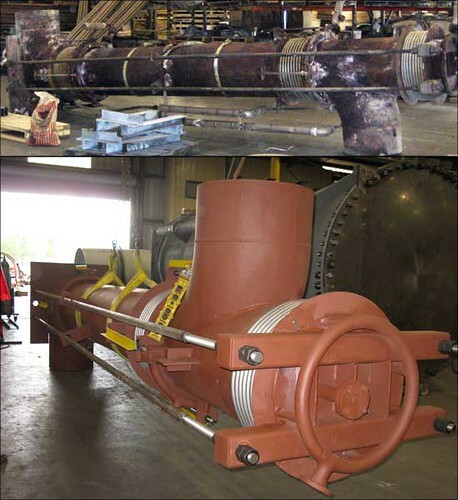 The second expansion joint was also for a high pressure turbine that was replaced during a planned outage. This expansion joint came in on October 30, 2006 and was ready to ship November 20, 2006. Overall length and center line to center line length were maintained to ensure easy installation. Both expansion joints were dye-penetrant tested and hydro-tested at 146 PSIG. 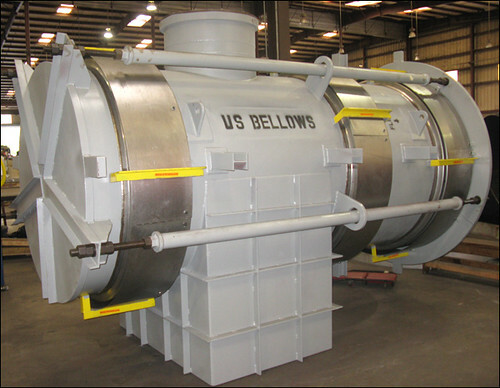 U.S Bellows, Inc, the expansion joint division of Piping Technology & Products, Inc., recently designed and fabricated three elbow pressure balanced expansion joints for a power station in Canada. 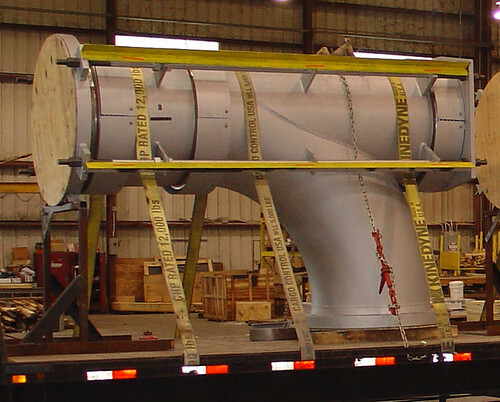 These joints are designed at 150 PSIG and 450ºF to allow lateral and axial movements in a 42″ steam line. Expansion joints were designed and fabricated per EJMA and B31.1 code. The expansion joints were hydro-tested at 225 PSIG and 75ºF. In order to detect any leaks in the weld, prior to and following forming, bellows long seam welds and attachment welds were 100% dye-penetrant tested.